(Nanowerk News) Inspired by the ease with which gecko lizards can move on almost any surface, researchers at Northeastern University, the Korea Institute of Science and Technology and Seoul National University hope to reproduce properties found in the gecko's footpad for applications ranging from adhesives to robotic movement and navigation. The team, led by Ashkan Vaziri, assistant professor of mechanical and industrial engineering at Northeastern, and Myoung-Woon Moon, of the Korea Institute of Science and Technology, created nanoscale and microscale patterned surfaces with adhesion and friction properties similar to that of the gecko footpad. The innovative methodology, published online and in the academic journal Soft Matter, could lead to the development of a "smart" adhesive that adapts to environmental stimuli, such as a curvy surface or a rough edge. 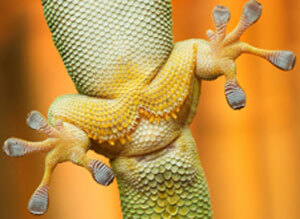 Geckos can move on virtually all surfaces, vertical and horizontal, due to their foot pads. "The gecko footpad's unique structure and function make it one of the most efficient adhesion systems found in nature," said Vaziri, who also directs Northeastern's High Performance Materials and Structures Laboratory. Gecko toes are covered by millions of hair-like structures called setae, each of which is five micrometers in size — smaller than a human hair. The ends of the setae are tipped with hundreds of spatula, which bend and conform to the surface on which the gecko is moving. These properties help geckos move robustly on virtually all vertical and horizontal surfaces. The research team designed and created a series of micropillars, or hair-like structures, and exposed them to ion beam radiation. The radiation tilted the micropillars, resulting in a dual-surface area with unique adhesion and friction properties. Through a series of experiments, the team found that the micropillars had qualitatively similar friction properties and function when compared to the gecko footpad. "If equipped with micropillars, small high-tech robots [for research or military applications] might be able to climb with speed, precision and accuracy on uneven, slippery surfaces," said Vaziri. The technology also could lead to a new generation of smart adhesives that are equipped to hold strong bonds with any surface, he said.